The 50th Anniversary of the OACC was celebrated in style on June 3-4, 2017, as hundreds of locals celebrated by singing with and listening to renowned composer Mr. Mark Hayes. The OACC brought Mark to town as a Golden Anniversary gift to the community. Concert audiences, church congregations, and student and adult choral singers have been singing and enjoying Mark Hayes original compositions and vocal arrangements for years, and to work with him and see him in person was a thrill for all. ​Mark conducted a community church choir of 55 singers at the very well-attended June 4 worship service at the First Presbyterian Church of Rome. The choir performed four Hayes works, and Mark offered two outstanding piano solos. Later that afternoon, the 105-singer OACC performed to a packed church, under the direction of Kimberly Nethaway and accompanied by Sam and Colleen Pellman and Bernadette VanValkenburg on piano and Amanda Yeoman on flute. The audience of about 500 enjoyed a concert that included seven of Mark’s choral works, six of them conducted by the composer himself. He accompanied another, and offered two piano solos of his arrangements. A big favorite in the concert was Mark conducting the chorus on his arrangement of “The Erie Canal”. The concert wasn’t all Mark Hayes, as it also featured the Founding Director of the Chorale, Mr. Darly Wonderly conducting one number. Daryl and wife Jeanne made the trip from Tucson, AZ, so he could lead “Hallelujah, Amen”, a song sung in the first OACC spring concert in 1967. Singers and audience members were thrilled to see Daryl and his family, and especially to see him at the front of the group once more. Another highlight of the concert was the piece “How Can I keep from Singing” , by local composer Samuel Pellman. The number, which was commissioned by the OACC, was accompanied by Sam and his wife, Colleen. Director Kimberly Nethaway continues to lead the OACC in stellar fashion. 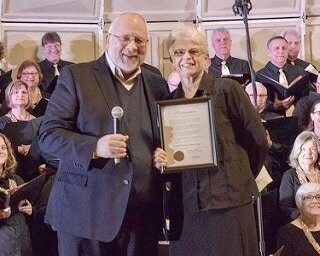 Her concept for the 50th Anniversary Celebration and her tireless efforts working with singers to produce high-quality choral performances are much appreciated by the entire Oneida-Rome-Utica area. Thank you to the many, businesses, organizations and private citizens who donated to our 2016-2017 Patron Program! It is these donations, along with ticket receipts from concerts, that make our successful seasons possible. We sincerely appreciate their generosity and support of the Chorale.